Yo u may add or subtract ingredients to your taste. Serve with a crusty roll for a great dinner. Soup doubles and freezes well. 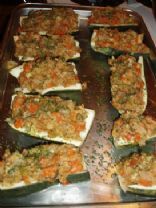 Zucchini boats stuffed with veggies and bread crumbs. I like to make this for dinner/ lunch, but it can also be made as an appetizer. 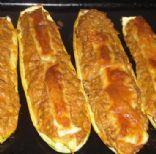 To do this you can cut the zucchini boats into smaller pieces after they have cooked. You can also substitute vegetables and herbs of your choice in this recipe. You can use cooking spray on the baking pan in place of the olive oil. A healthier, updated take on the '70s party food classic. These are quick to prepare and easy on both your wallet and your waistline. The garlic in this recipe gives the zucchini a divine flavor.